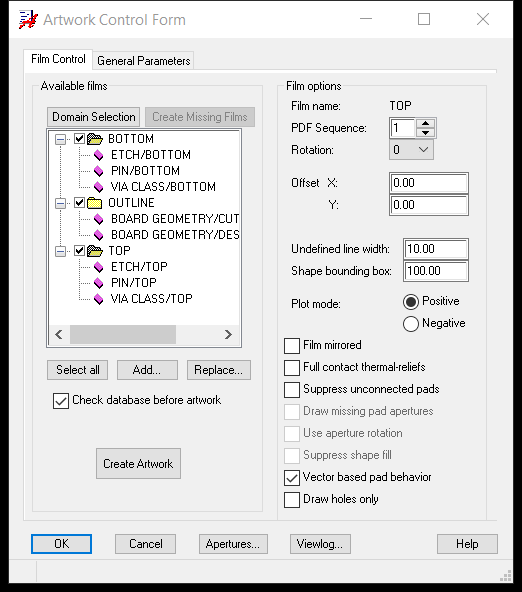 For OrCAD users who want to mill their circuit board designs on the Bantam Tools Desktop PCB Milling Machine, here are instructions to generate Gerber files that can be imported to the Bantam Tools Desktop Milling Machine Software. OrCAD is a commercial app suite for designing circuits, made by Cadence. OrCAD PCB Designer is the program within the suite used to design circuit boards. OrCAD runs on Windows only. Where do I get OrCAD? A Lite version of OrCAD is available on the site. The commercial version is available through OrCAD distributors. Where can I find documentation about OrCAD? You can also find OrCAD’s resource library on the site. How do I get my board from OrCAD into Bantam Tools Desktop Milling Machine Software? 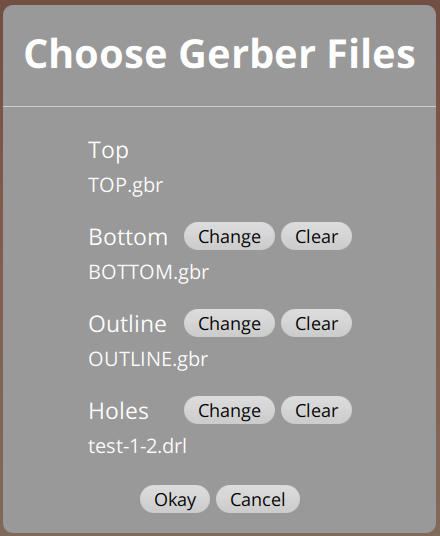 You’ll need to configure OrCAD to export Gerbers and NC Drill Files in a format that the software can understand. To do so, follow these instructions. These instructions were tested on OrCAD PCB Designer Lite 17.2-2016. Settings and screenshots may differ for other versions. 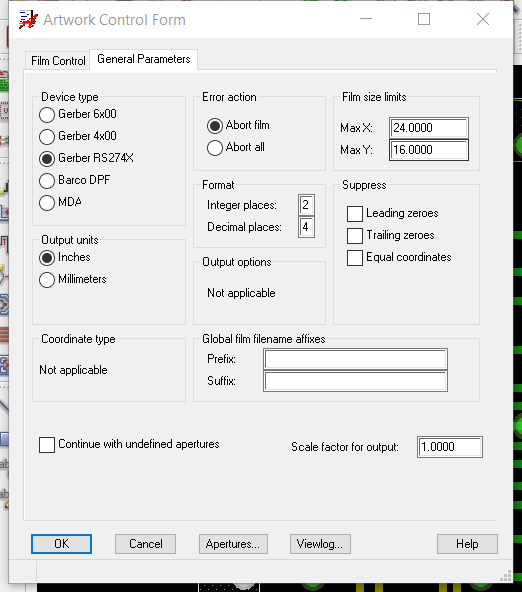 In OrCAD PCB Designer, click Export > Gerber. In the Film Control tab, right-click the TOP film (it has a folder icon) and select Add Manual. Enter “OUTLINE” for the film name and click OK. 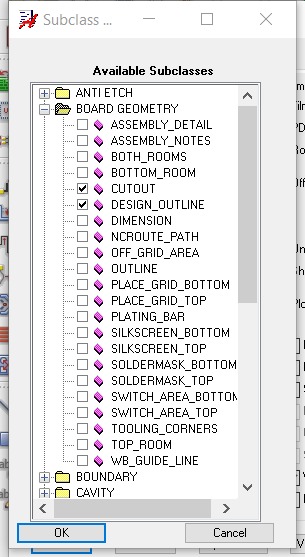 In the Available Subclasses window that appears, click the plus icon to expand the BOARD GEOMETRY class, check the boxes next to DESIGN_OUTLINE and CUTOUT, and click OK. Depending on your design, you may need to select OUTLINE as well. Check the boxes next to BOTTOM, OUTLINE, and TOP. Click Create Artwork to generate Gerbers. These will be created as TOP.art, BOTTOM.art, and OUTLINE.art. You'll need to rename these to have a .gbr extension so that the software will load them. Click Export > NC Drill. 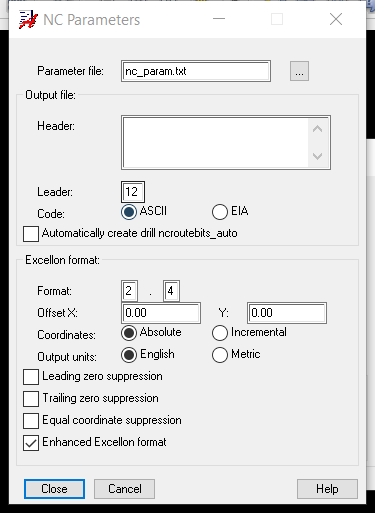 Click the NC Parameters button. 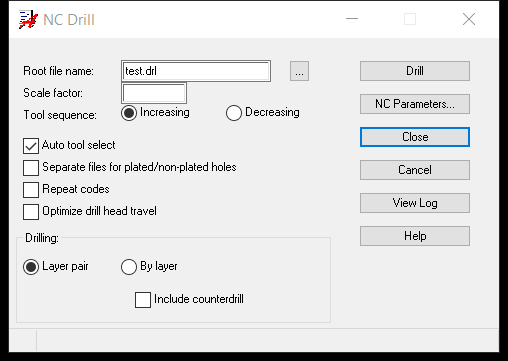 Click Drill to generate the drill file. In the resulting dialog, ensure the correct files are selected for the Bottom (if you’re milling a double-sided board), Outline, and Holes (ends in .drl). See the screenshot below for an example.